Note - See separate catalog item for the Standard version of this rack without Pannier Loops. Sorry, this is to provide for more accurate calculation of the shipping due to the larger size of the PL version. Note - Since this is a NEW product please bare with us as we bring it online. We may have a few missing photos but we will post them as they are available. Also, we have had a lot of demand for this product so delivery may be a bit long... but we will get your order to you ASAP! 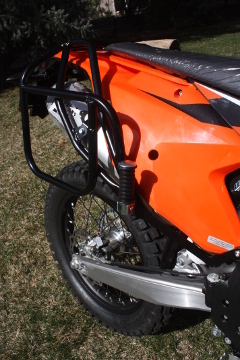 This is our new luggage rack system for the 2017 KTM bikes 250 thru 500 cc. The design has changed because KTM made major changes to their products in an effort to lighten them. Let's take a look at the impact to the luggage system. 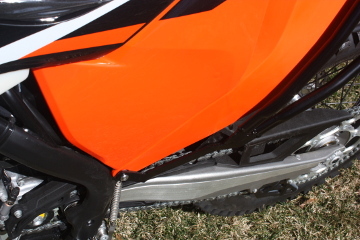 Bike Change Overview (as it impacts the luggage system) – KTM has redesigned their entire product line by moving the subframe to main frame attach points upward, extending the seat aft, moving the seat attach screws from under the fender to the upper sides of the fender and “slimming” the area where the rider's legs contact the subframe plastic. Fortunately, a broad group of bike sizes & styles use the same subframe & plastic so one design fits many bikes. Seat length increase – The top rack is now shorter fore & aft due to interference of the front tube with the seat. It is now 10 in wide x 7.75 in long (about the size of the Mini rack of the previous product) which is still sufficient to carry a RotoPax and /or a sleeping bag, etc. And most importantly, the rack still clears the seat for easy seat removal. Attach points – The forward lugs of the rack still attach to the main frame / sub frame lugs, they are just in a new, higher location. The previous under the seat “Y” link gas been replaced with a “T” link functioning in the same manner to unload the subframe. There is still a RH sway bracket attaching to the rear bolt of the muffler. No plastic cutting is required. 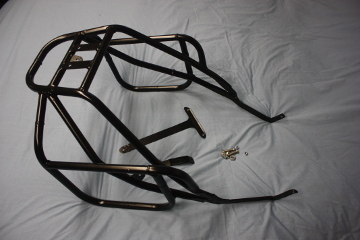 The forward ends of the rack extends below the subframe plastic & are positioned so that the rack does not impact the riders legs. In short, your legs will not know that the rack is installed. Added features – A major effort has been expended to keep the rider from contacting the rack when he is rotated back to the rear of the bike by routing the rack structure behind the rider range of motion. Additionally, the pannier racks are located as far forward as possible to keep the pannier center of gravity forward of the rear axle while still clearing the rider's legs. This, hopefully, will provide better control with minimal annoyance thru all riding conditions. Construction – The rack is designed to carry up to 60 lbs / 27 kg of load securely with out damaging the subframe. This is due to the unique design of the rack system. The main structure is made of welded .75 inch /19 mm diameter steel tube powder coated satin black. All attachment hardware and installation instructions are supplied. Available options – Most riders like to customize their luggage system to fit their needs. The rack build process starts with the “Standard” rack. You then add the features you want thus keeping the cost & weight to a minimum. The Standard Rack version – Our most popular configuration. It is good for the weekend ride or maybe up to a week assuming you don't want to carry the proverbial kitchen sink. Note – Many options are available so hopefully you will find your desired combination. Also, some options like the heat shield are offered at a discounted price. Daisy loops – These are intended to support our 300170 Mini bags (available in 5, 10 & 15 liter sizes) but also work to attach many other bag systems. Select the DL option. Note – This works best on the mini rack version not the pannier rack version since the pannier racks make the loops inaccessible. Giant Loop bags – This is the former “GL” option. Many owners of the Giant Loop products like to use our rack to carry the GL bags because it unloads the subframe as well as lifts the GL bag off the plastic to reduce chafing & scratching. Select the GL option. Footpegs – The footpeg option has also proved popular. Select the FP option. Note - We need to remind everyone, this does NOT reduce the load on the seat or subframe (the no 2 rider still is on the seat) so it is not to be used with adults. This is intended for carrying children a short distance. Not an Adult! Safety is the operators responsibility! 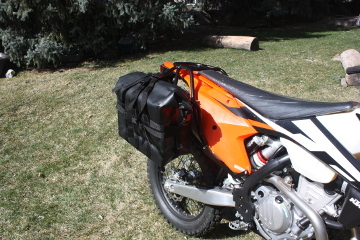 The “Pannier Rack” version – This system is designed for the longer trip. It allows you to fit nearly any saddle bag known to exist. You can also select the GL, FP and other options as desired. Giant Loop bags – Again, many owners of the Giant Loop products like to use our rack to carry the GL bags because it unloads the subframe as well as lifts the GL bag off the plastic to reduce chafing & scratching. Warning – These bikes are lightweight dirt bikes. As such they are delivered to carry a 'typical” rider of 165-187 lb. Depending on YOUR weight, even the addition of the mini rack will impact handling & performance. This means you need to set up your bike to carry the additional load. See our Suspension Setup page on helpful tips on how to do this!